ST. LOUIS, April 9, 2019 /PRNewswire/ -- Datix, a St. Louis-based software consulting firm, is set to exhibit their services and solutions at Insights, Epicor's annual users conference. 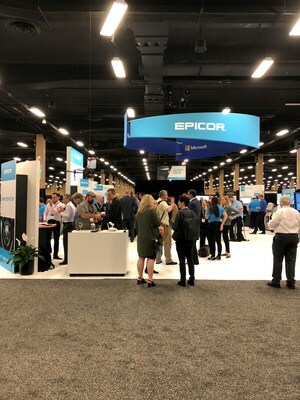 Epicor®, a premier ERP vendor for manufacturing, distribution and service industries, hosts the Insights conference every year to provide over 4,000 users education in Epicor solutions and products and networking opportunities. Several Datix executives will attend Insights, including CEO Matt Schuval, CIO Thomas Falteich, CTO Mark Chinsky, CMBDO Candice Evertowski, EVP of Software Development TJ McDowell, EVP of Delivery Jay Epperson and VP of Solution Engineering Paul Arthur. They will be discussing their line of products and services at booth four. "Unity was built to meet our clients' challenges," explains Schuval. "As certified partners of Epicor and leading CRM solutions, including Microsoft Dynamics 365, we noticed that many of our clients were implementing their ERP and CRM systems separately. This resulted in dual data entries, limited visibility and other inefficiencies. With expertise in our clients' industries as well as CRM and ERP, we figured we could create the ideal integration solution for manufacturing and distribution." According to Evertowski, "Every solution is created with best practices and our clients' needs in mind. Unity for HubSpot, for example, combines the power of ERP and Marketing Automation to boost sales. Our solutions are allowing manufacturers and distributors to increase profits and optimize their performance." Falteich explains why he is excited to go to the conference and present their solutions: "Epicor users should always be exploring ways to get even more from their ERP instances. This is an exciting opportunity to show the user community how they can generate more ROI, become global powerhouses and improve customer experiences with our services and solutions." Epicor Insights will convene at the Mandalay Bay Resort and Casino in Las Vegas, NV from April 15-18. Datix's participation at the conference further solidifies its position as a leader in the Epicor community. Datix is a premier software services company based in St. Louis. For over 20 years, we have worked with clients in a wide range of discrete manufacturing and product distribution industries. Besides being an Epicor Gold Partner, we are also a certified partner with Microsoft Dynamics 365 and Salesforce CRM. Datix specializes in business process management and enterprise application solutions, including customizable integration options. Unity is Datix's pre-built integration solution for ERP, CRM, eCommerce and Marketing Automation software, available to connect your solution seamlessly without any of the normal errors or bugs that can come with integration.